Be ready to leave the trailhead behind, rain or shine, in the Merrell Kids Moab FST Low Waterproof hiking shoe. Synthetic and mesh upper. M SELECT DRY technology seals out water while allowing moisture to escape, so feet stay cooler and drier. Bellows tongue helps keep debris out. Lace-up closure for a secure fit. Front and back pull tabs. Breathable mesh lining. Cushioned footbed for underfoot support. Molded nylon shank adds arch support. Durable rubber outsole with M SELECT Grip for excellent traction. Imported. Measurements: Weight: 12.4 oz Product measurements were taken using size 6 Big Kid, width M. Please note that measurements may vary by size. Weight of footwear is based on a single item, not a pair. Be ready to leave the trailhead behind, rain or shine, in the Merrell Kids Moab FST Low A/C Waterproof hiking shoe. Synthetic and mesh upper. M SELECT DRY technology seals out water while allowing moisture to escape, so feet stay cooler and drier. Bellows tongue helps keep debris out. Lace-up closure with a hook-and-loop strap for easy adjustability. Front and back pull tabs. Breathable mesh lining. Cushioned footbed for underfoot support. Molded nylon shank adds arch support. 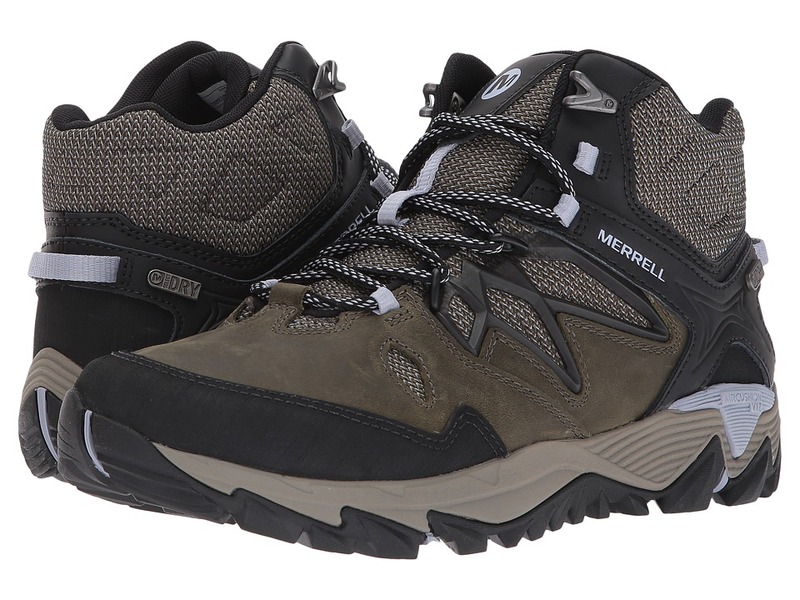 Merrell air cushioning in the heel absorbs impacting shock and adds stability. Durable rubber outsole with M SELECT Grip for excellent traction. Imported. Measurements: Weight: 12 oz Product measurements were taken using size 6.5 Big Kid, width M. Please note that measurements may vary by size. Weight of footwear is based on a single item, not a pair. 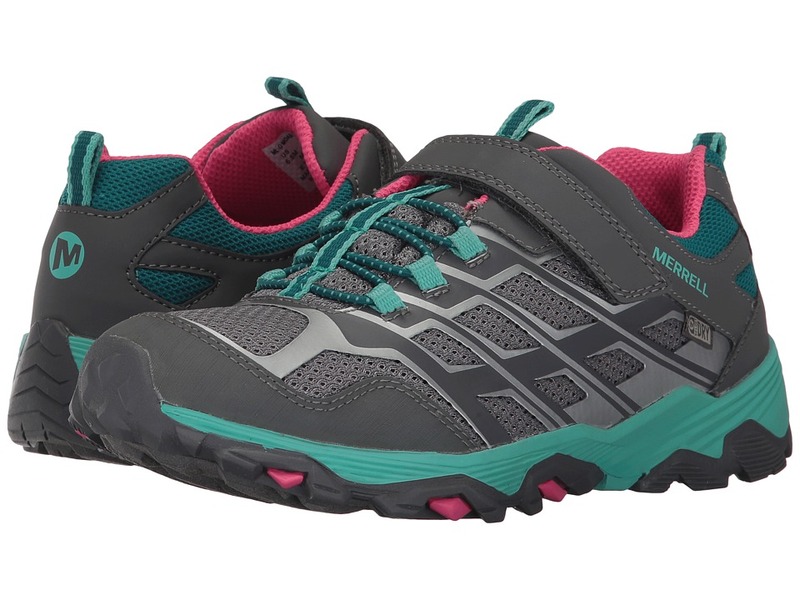 Be ready to leave the trailhead behind, rain or shine, in the Merrell Kids Moab FST Mid A/C Waterproof hiking shoe. Synthetic and mesh upper. M SELECT DRY technology seals out water while allowing moisture to escape, so feet stay cooler and drier. Bellows tongue helps keep debris out. Lace-up closure with a hook-and-loop strap for easy adjustability. Front and back pull tabs. Breathable mesh lining. Cushioned footbed for underfoot support. Molded nylon shank adds arch support. 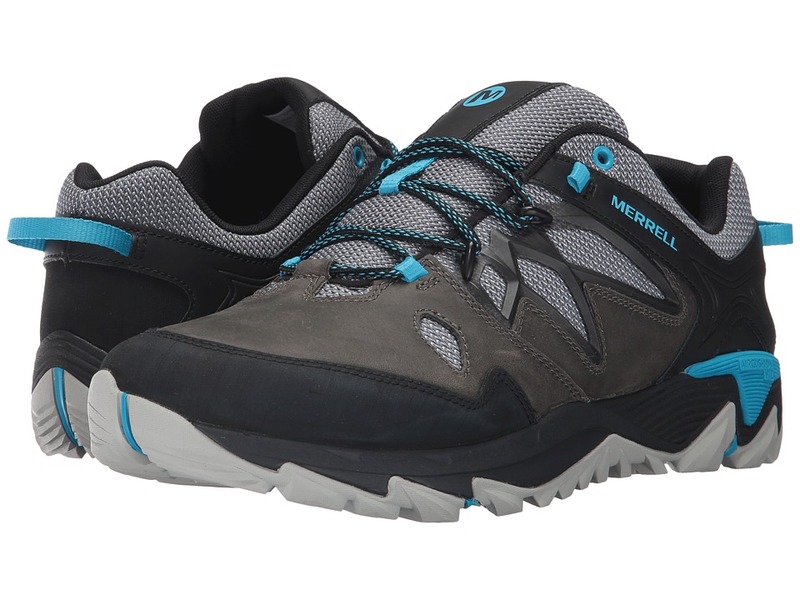 Merrell air cushioning in the heel absorbs impacting shock and adds stability. Durable rubber outsole with M SELECT Grip for excellent traction. Imported. Measurements: Weight: 8.4 oz Product measurements were taken using size 11 Little Kid, width M. Please note that measurements may vary by size. Weight of footwear is based on a single item, not a pair. 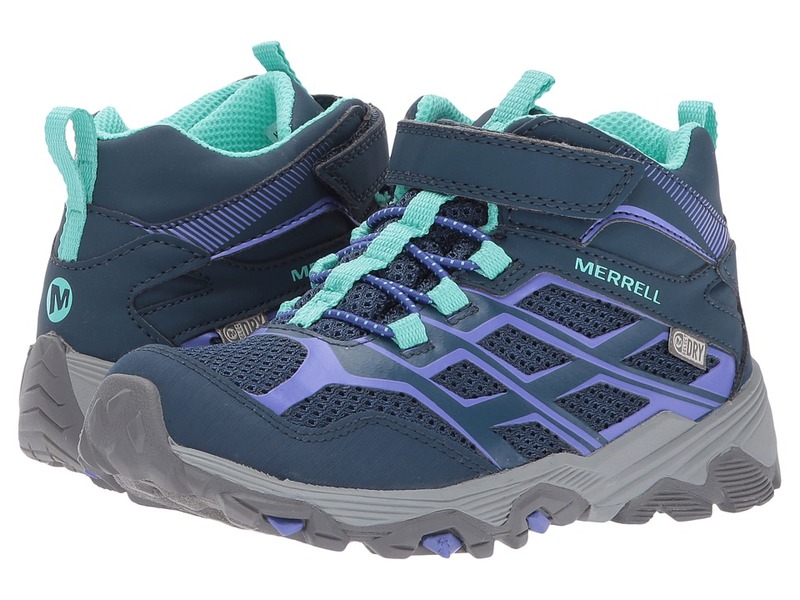 Be ready to leave the trailhead behind, rain or shine, in the Merrell Kids Moab FST Mid A/C Waterproof hiking shoe. Synthetic and mesh upper. M SELECT DRY technology seals out water while allowing moisture to escape, so feet stay cooler and drier. Bellows tongue helps keep debris out. Lace-up closure with a hook-and-loop strap for easy adjustability. Front and back pull tabs. Breathable mesh lining. Cushioned footbed for underfoot support. Molded nylon shank adds arch support. Merrell air cushioning in the heel absorbs impacting shock and adds stability. Durable rubber outsole with M SELECT Grip for excellent traction. Imported. Measurements: Weight: 13.1 oz Product measurements were taken using size 7 Big Kid, width M. Please note that measurements may vary by size. Weight of footwear is based on a single item, not a pair. 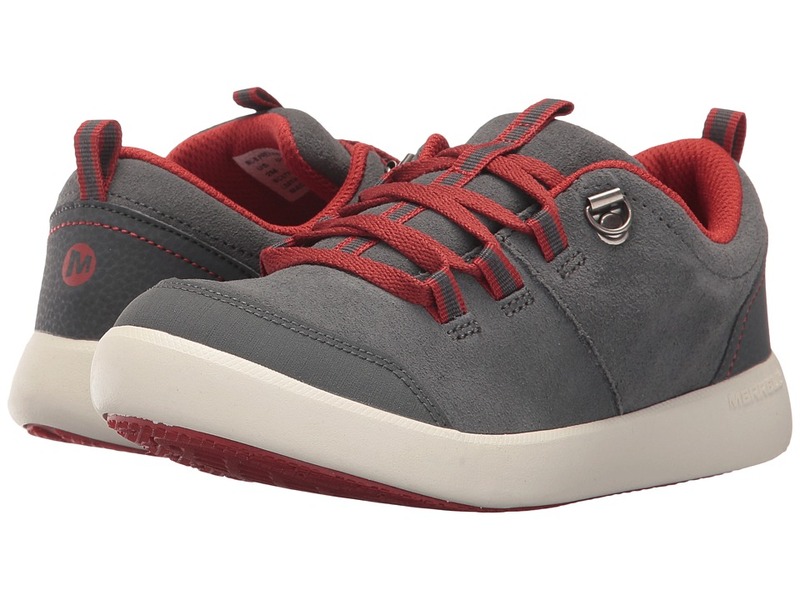 Cool, casual style is what the Freewheel LTT sneaker is all about. Water-resistant suede upper. Lace-up system for a secure fit and easy adjustability. Front and back pull loops for easy entry. Padded tongue and collar. Breathable mesh lining. Cushioned insole for underfoot comfort and support. M Select GRIP outsole delivers durable, reliable traction. Imported. Measurements: Weight: 10 oz Product measurements were taken using size 2 Little Kid, width M. Please note that measurements may vary by size. Weight of footwear is based on a single item, not a pair. 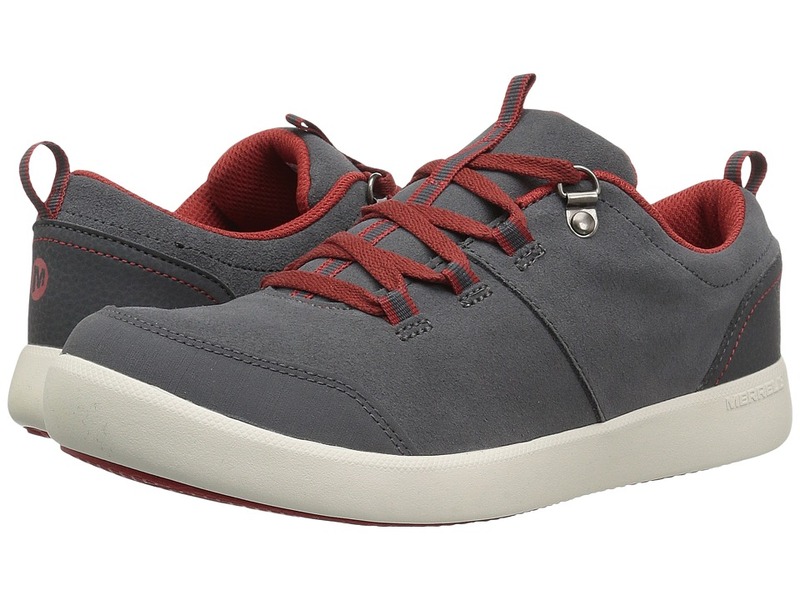 Cool, casual style is what the Freewheel LTT sneaker is all about. Water-resistant suede upper. Lace-up system for a secure fit and easy adjustability. Front and back pull loops for easy entry. Padded tongue and collar. Breathable mesh lining. Cushioned insole for underfoot comfort and support. M Select GRIP outsole delivers durable, reliable traction. Imported. Measurements: Weight: 12 oz Product measurements were taken using size 3.5 Big Kid, width M. Please note that measurements may vary by size. Weight of footwear is based on a single item, not a pair. Nothing~s going to slow you down when you trek in the outstanding performance of the Merrell All Out Blaze 2 Mid Waterproof hiking boot. M Select DRY membrane seals water out, while allowing moisture to escape. Upper features a combination of full grain leather and mesh. Lace-up closure. Bellows tongue helps keep debris out. Protective toe cap. Heel pull loop. Padded tongue and collar. Comfortable fabric lining offers a great in-shoe feel. M Select FRESH antimicrobial agent helps reduce odors. FIT.ECO EVA footbed is contoured and controls odors. Compression-molded EVA midsole provides stability and lasting comfort. Molded nylon arch shank. High-rebound Merrell Air Cushion Viz EVA foam pod in the heel absorbs shock and adds stability. Vibram TC5+ rubber outsole delivers unmatched durability, stability, and grip. 4.5 mm lug depth. Imported. Measurements: Weight: 1 lb 1 oz Product measurements were taken using size 11.5, width M. Please note that measurements may vary by size. Weight of footwear is based on a single item, not a pair. Enjoy the outdoors no matter the weather or terrain with the All Out Blaze 2 Mid Waterproof hiking shoe. Leather and mesh upper materials. M Select DRY impermeable membrane seals out water and lets moisture escape. Bellows tongue helps keep debris out. Lace-up closure. Molded TPU external heel counter adds stability. Heel pull loop. Plush tongue and collar. Breathable mesh lining offers a great in-shoe feel. FIT.ECO blended EVA contoured footbed with organic odor control. M Select FRESH antimicrobial agents reduces shoe odor. Compression molded EVA midsole for stability and comfort. Air Cushion Viz with high rebound EVA foam pod in the heel absorbs shock and adds stability. Vibram TC5+ outsole with 4.5 mm hollowed lugs for reliable traction over mixed terrain. Imported. Measurements: Weight: 13 oz Product measurements were taken using size 8, width M. Please note that measurements may vary by size. Weight of footwear is based on a single item, not a pair. Get the most out of your outdoor adventures with the All Out Blaze 2 Waterproof hiking shoe. Leather and mesh upper materials. M Select DRY impermeable membrane seals out water and lets moisture escape. Bellows tongue helps keep debris out. Lace-up closure. Molded TPU external heel counter adds stability. Heel pull loop. Plush tongue and collar. Breathable mesh lining offers a great in-shoe feel. FIT.ECO blended EVA contoured footbed with organic odor control. M Select FRESH antimicrobial agent reduces shoe odor. Compression-molded EVA midsole for stability and comfort. Air Cushion Viz with high-rebound EVA foam pod in the heel absorbs shock and adds stability. Vibram TC5+ outsole with 4.5 mm hollowed lugs for reliable traction over mixed terrain. Imported. Measurements: Weight: 1 lb Product measurements were taken using size 11.5, width M. Please note that measurements may vary by size. Weight of footwear is based on a single item, not a pair. 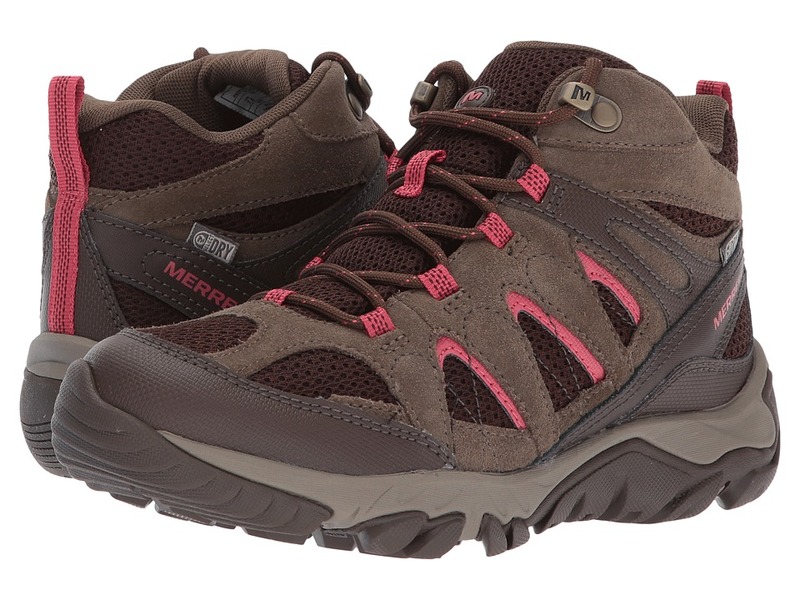 The All Out Blaze 2 light hiker will ensure comfort on long treks. Leather and mesh upper materials. Bellows tongue helps keep debris out. Lace-up closure. Molded TPU external heel counter adds stability. Heel pull loop. Plush tongue and collar. Breathable mesh lining offers a great in-shoe feel. FIT.ECO blended EVA contoured footbed with organic odor control. M Select FRESH antimicrobial agents reduces shoe odor. Compression molded EVA midsole for stability and comfort. Air Cushion Viz with high rebound EVA foam pod in the heel absorbs shock and adds stability. Vibram TC5+ outsole with 4.5 mm hollowed lugs for reliable traction over mixed terrain. Imported. Measurements: Weight: 15 oz Product measurements were taken using size 11, width M. Please note that measurements may vary by size. Weight of footwear is based on a single item, not a pair. The All Out Blaze 2 light hiker will ensure comfort on long treks. Leather and mesh upper materials. Bellows tongue helps keep debris out. Lace-up closure. Molded TPU external heel counter adds stability. Heel pull loop. Plush tongue and collar. Breathable mesh lining offers a great in-shoe feel. FIT.ECO blended EVA contoured footbed with organic odor control. M Select FRESH antimicrobial agents reduces shoe odor. Compression molded EVA midsole for stability and comfort. Air Cushion Viz with high rebound EVA foam pod in the heel absorbs shock and adds stability. Vibram TC5+ outsole with 4.5 mm hollowed lugs for reliable traction over mixed terrain. Imported. Measurements: Weight: 12 oz Product measurements were taken using size 8.5, width M. Please note that measurements may vary by size. Weight of footwear is based on a single item, not a pair. 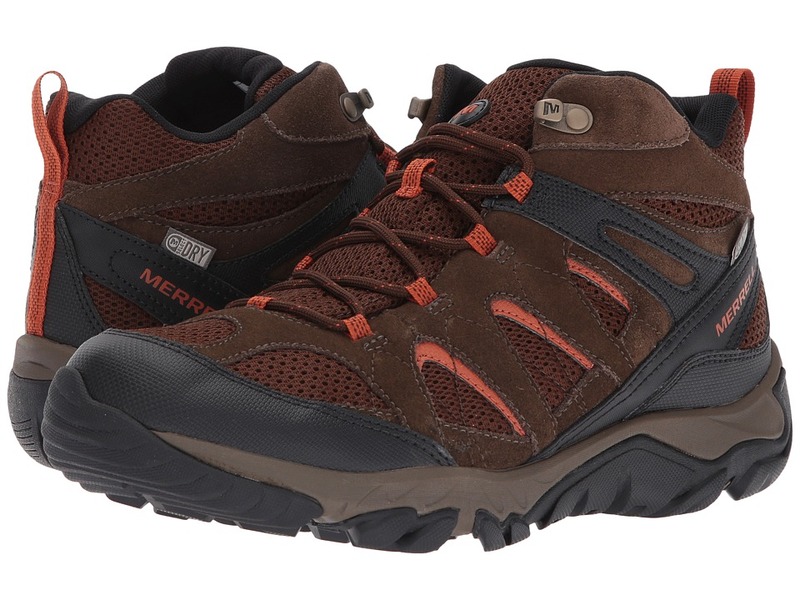 There is no need to avoid rainy day adventures when you trek in the Merrell Outmost Mid Vent Waterproof hiking boot. M Select DRY membrane seals water out, while allowing moisture to escape. Waterproof suede leather and mesh upper materials. Lace-up closure. Bellows tongue helps keep debris out. Padded tongue and collar. Breathable mesh lining. 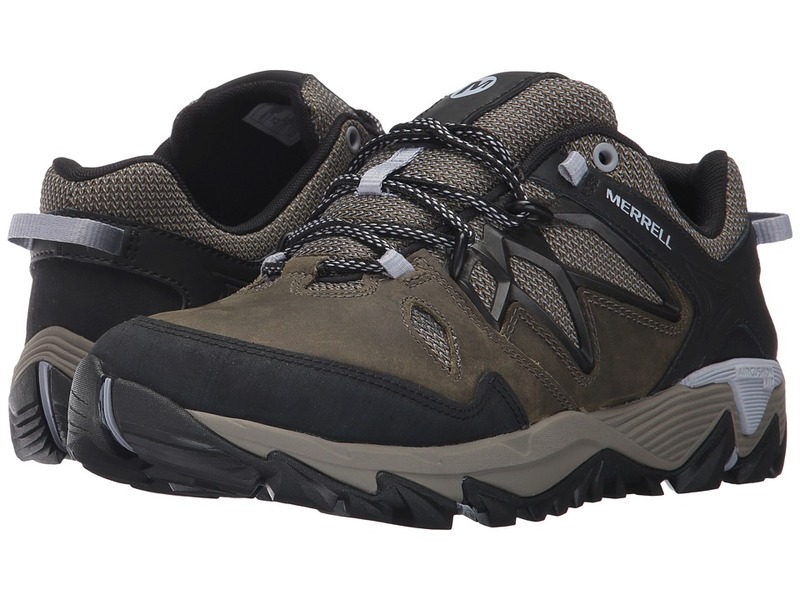 Merrell M Select FIT.ECO footbed is contoured and features organic odor control for a fresher in-shoe environment. EVA midsole provides stability and comfort. Molded nylon arch shank. 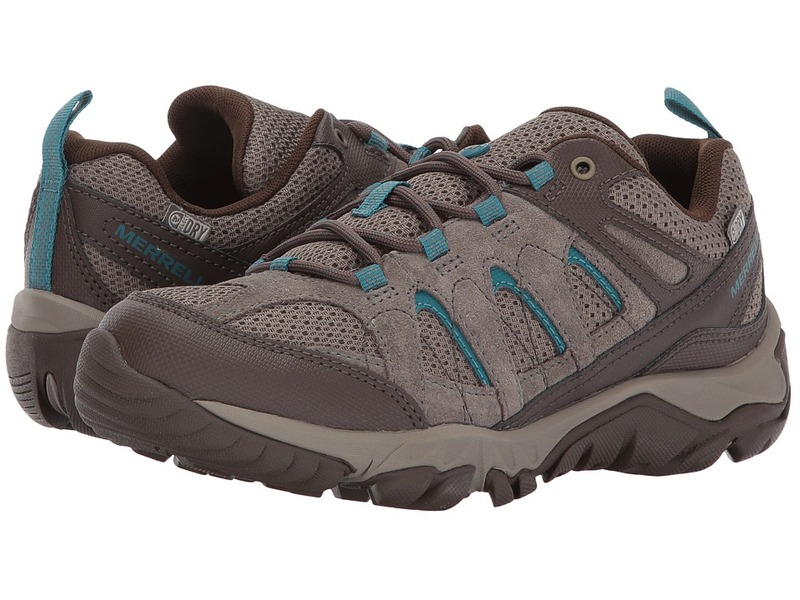 Merrell Air Cushion in the heel absorbs shock and adds stability. M Select GRIP delivers durable traction and grip. 5 mm lug depth. Imported. Measurements: Weight: 1 lb 1 oz Product measurements were taken using size 11.5, width M. Please note that measurements may vary by size. Weight of footwear is based on a single item, not a pair. 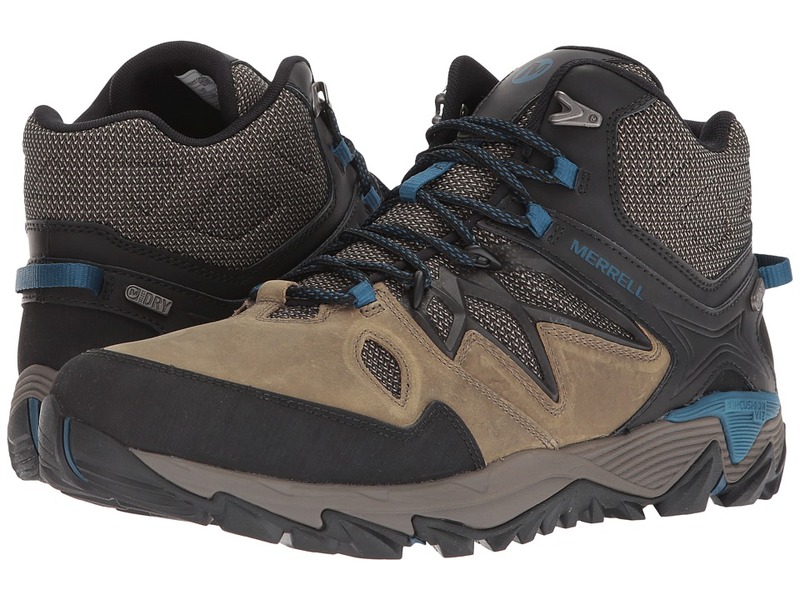 There is no need to avoid rainy day adventures when you trek in the Merrell Outmost Mid Vent Waterproof hiking boot. M Select DRY membrane seals water out, while allowing moisture to escape. Waterproof suede leather and mesh upper materials. Lace-up closure. Bellows tongue helps keep debris out. Padded tongue and collar. Breathable mesh lining. 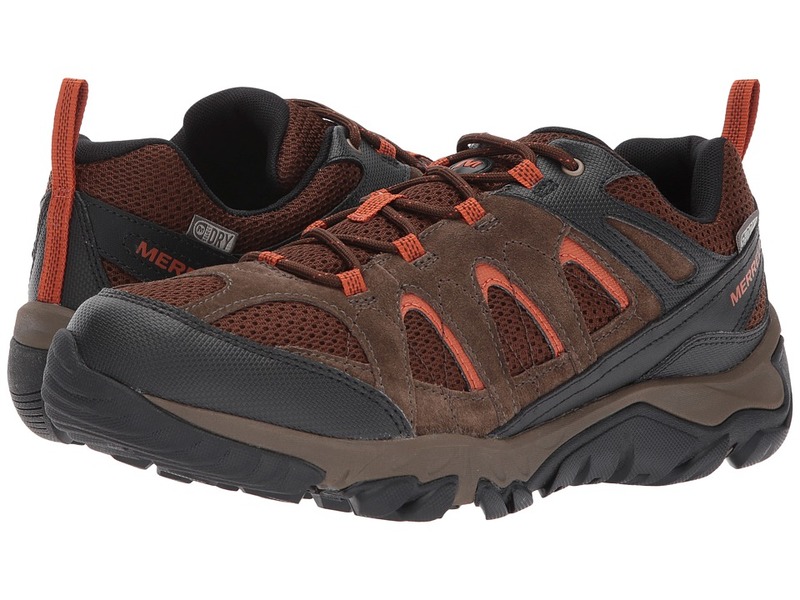 Merrell M Select FIT.ECO footbed is contoured and features organic odor control for a fresher in-shoe environment. EVA midsole provides stability and comfort. Molded nylon arch shank. 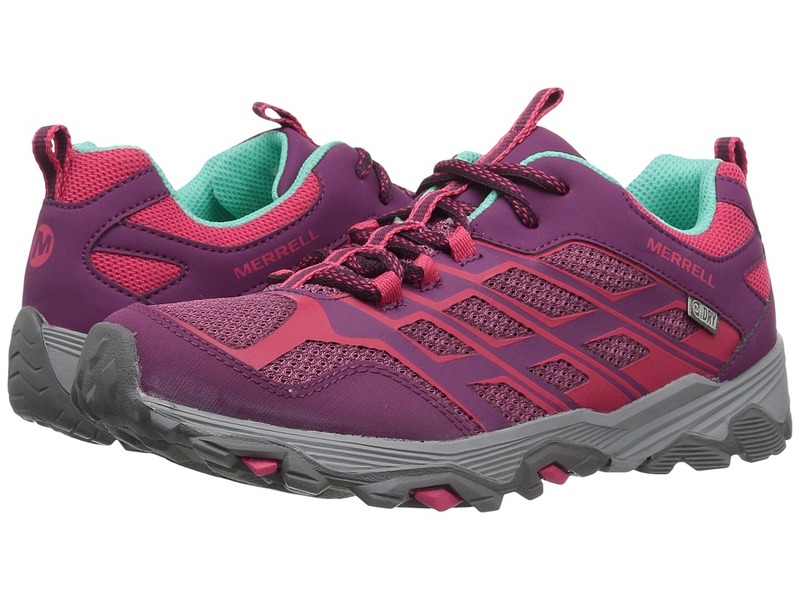 Merrell Air Cushion in the heel absorbs shock and adds stability. M Select GRIP delivers durable traction and grip. 5 mm lug depth. Imported. Measurements: Weight: 13 oz Product measurements were taken using size 7.5, width M. Please note that measurements may vary by size. Weight of footwear is based on a single item, not a pair. Don~t let a little rain spoil the hike. The Outmost Vent Waterproof light hiking shoe. Waterproof suede and textile mesh uppers. M Select DRY impermeable membrane seals out water and lets moisture escape. Full lace-up closure. Bellows tongue. Breathable mesh interior. M Select FIT.ECO+ blended EVA footbed features organic odor control. Nylon arch shank. Air cushioning in the heel. M Select GRIP traction outsole. Imported. Measurements: Weight: 15 oz Product measurements were taken using size 11, width M. Please note that measurements may vary by size. Weight of footwear is based on a single item, not a pair. Don~t let a little rain spoil the hike. The Outmost Vent Waterproof light hiking shoe. Waterproof suede and textile mesh uppers. M Select DRY impermeable membrane seals out water and lets moisture escape. Full lace-up closure. Bellows tongue. Breathable mesh interior. M Select FIT.ECO+ blended EVA footbed features organic odor control. Nylon arch shank. Air cushioning in the heel. M Select GRIP traction outsole. Imported. Measurements: Weight: 11 oz Product measurements were taken using size 7.5, width M. Please note that measurements may vary by size. Weight of footwear is based on a single item, not a pair. 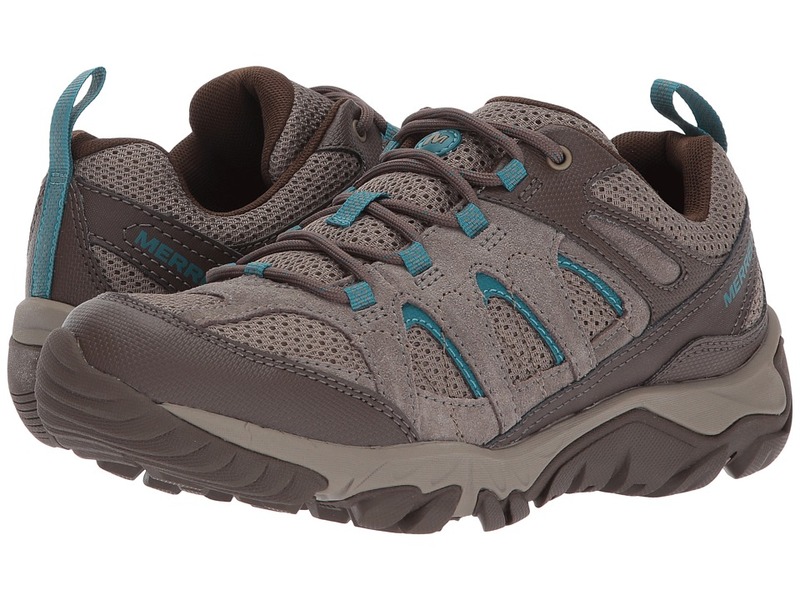 When the hike heats up, stay cool in the Outmost Vent light hiking shoe. Suede and textile mesh uppers. Full lace-up closure. Bellows tongue. Breathable mesh interior. M Select FIT.ECO+ blended EVA footbed features organic odor control. Nylon arch shank. Air cushioning in the heel. M Select GRIP traction outsole. Imported. Measurements: Weight: 14 oz Product measurements were taken using size 11, width M. Please note that measurements may vary by size. Weight of footwear is based on a single item, not a pair. 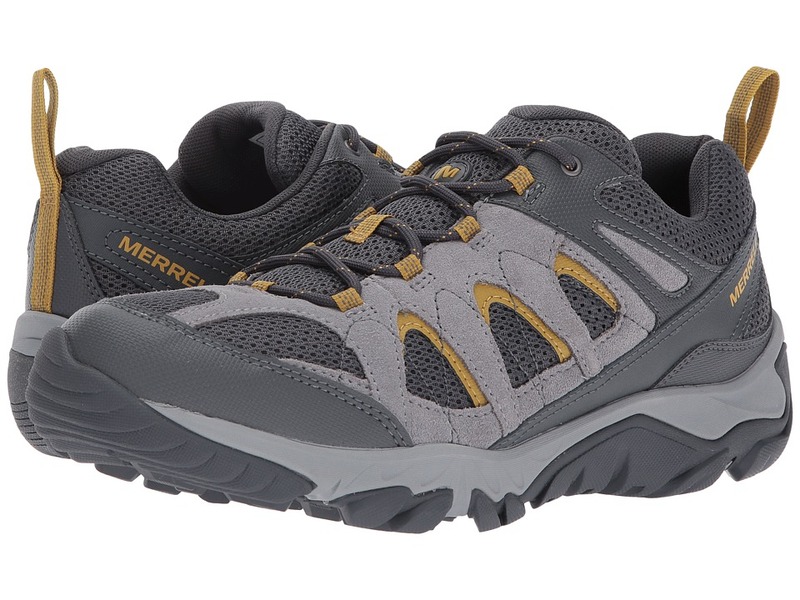 Adventure from sunup to sundown in the Merrell Outmost Vent hiking shoe! Suede leather and mesh upper materials. Lace-up closure. Bellows tongue helps keep debris out. Padded tongue and collar. Breathable mesh lining. 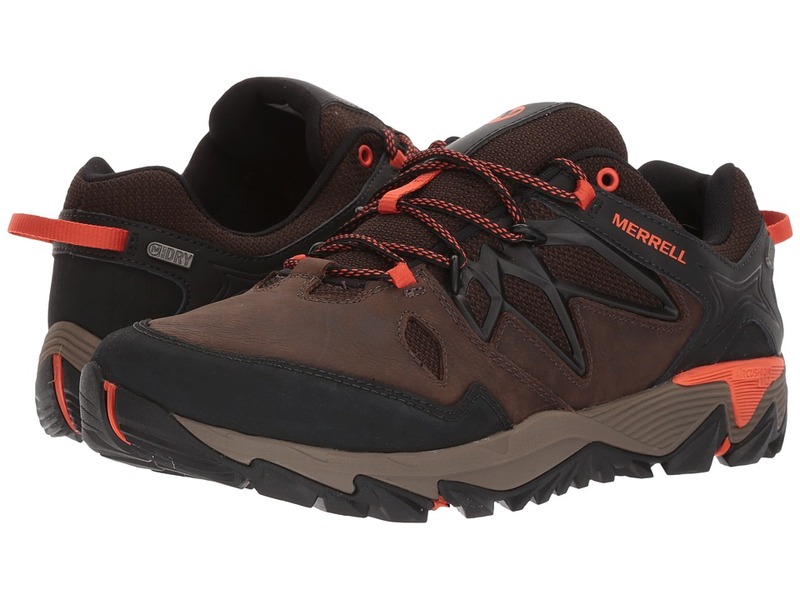 Merrell M Select FIT.ECO footbed is contoured and features organic odor control for a fresher in-shoe environment. EVA midsole provides stability and comfort. Molded nylon arch shank. 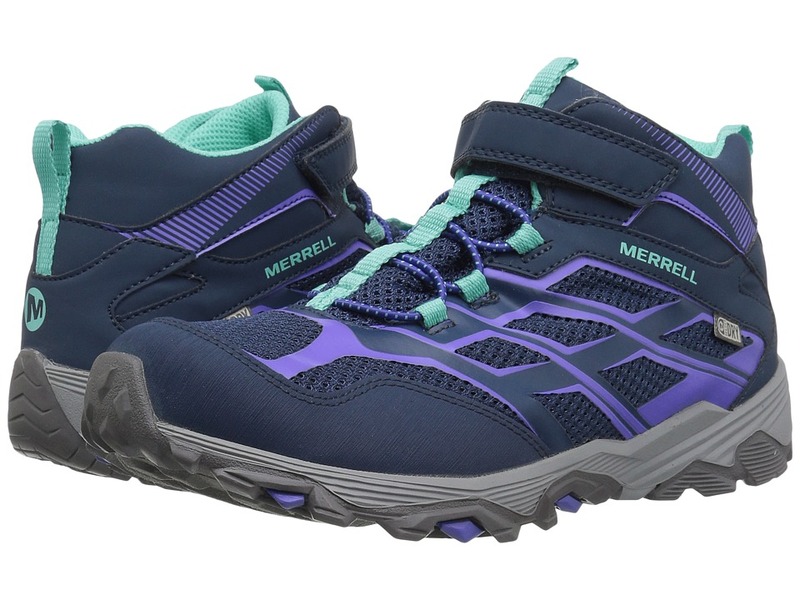 Merrell Air Cushion in the heel absorbs shock and adds stability. M Select GRIP delivers durable traction and grip. 5 mm lug depth. Imported. Measurements: Weight: 11 oz Product measurements were taken using size 8, width M. Please note that measurements may vary by size. Weight of footwear is based on a single item, not a pair.